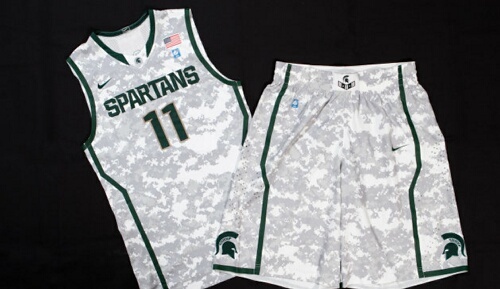 The Michigan State and North Carolina men’s basketball teams will wear school-color camouflage-style uniforms to honor the military during the Quicken Loans Carrier Classic on Veterans Day aboard the aircraft carrier Carl Vinson in San Diego. On Monday, the Spartans showed off the camouflage-patterned unis they’ll wear — white with a light green pattern and bordered with the school’s traditional dark green. Will these uniforms be available for the general public to purchase anywhere, my son loves them. Thank you.